Shortly after I arrived in Bali, the island began celebrating Galungan, which marks the beginning of a ten-day Balinese Hindu holiday that a taxi driver equated to Christmas. During this celebration, which typically occurs twice a year, the Balinese people celebrate the victory of dharma (good) over adharma (evil), and honor the creator of the universe and the spirits of their ancestors. At the beginning of the holiday, ancestors visit the earth from heaven. On the last day, the ancestors return. I am neither Balinese nor Hindu – the holiday isn’t meant for me. Nonetheless, I have been privileged enough to witness and to be included in some aspects of the festival during my time here. Throughout the festivities, the island is adorned with canang sari, small daily offerings that consist of symbolic objects like flowers, incense, or cigarettes placed in palm-leaf baskets on the ground or in front of temples. 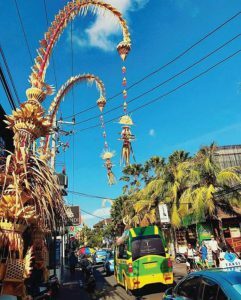 Bamboo poles (penjor) arc over the narrow streets, decorated with fruit, coconut leaves, flowers and ribbons. During the celebration days, women wear a blouse made of delicate lace called a kebaya and a sarong. Men also wear sarongs with an udeng on their heads. Manis Galungan occurs on the second day – an occasion to visit family and close friends after the initial Galungan celebration. I was invited to my friend’s family celebration in Mengwi, an inland sub-district in Badung. She only gets to see her family once or twice a year and she worries about her aging grandmothers. We sat in the shade in the courtyard of her family’s houses, drank Bingtang and arak (a tangy Balinese liquor made from coconut palms) and played with her mischievous daughters, nieces and nephews. In the afternoon, we visited Pura Taman Ayun, a towering temple in Mengwi with florid gardens, canals, ponds and fountains. Visitors to Bali must pay 20,000 rupiah to enter the temple and wear a sarong to cover their legs. On the way back to my friend’s house, we passed the figure of Barong in the back of a pick-up truck. Barong, she explained, is a mythical lion-like animal who is the king of the spirits and of good. Barongs and Barong dances are common in Bali during this time of year, oftentimes accompanied by gamelan music. During the dances, two men in the Barong figure dance in a portrayal of his defeat of the malevolent witch Rangda. The final day of the festival is Kuningan, held this year on June 9, when ancestors return back to heaven. 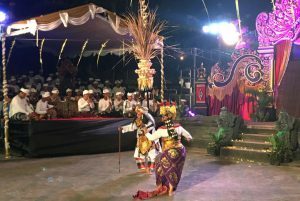 I watched a celebration performance held at night at Segara Temple, one of the Kuta village temples at Kuta Beach, that featured Balinese performance art. An orchestra of around 30 men performed gamelan music, a genre that involves echoing percussion, bamboo flutes, and a string instrument called a rebab. Women performed the legong – a Balinese dance where performers wear intricate gold headpieces and colorful silk wraps. Legong dancers train for hours to master complex footwork, finger and hand movements and coordination with the gamelan music. The performances stretched late into the night, the gamelan mingling with the sound of waves lapping against the shore. 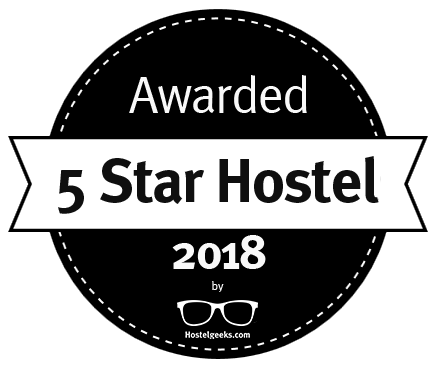 I took a motorbike back to the hostel, speeding through alleyways decorated with lofty bamboo poles, hearing ghost-like gamelan in the distance, imagining ancestral spirits returning from their brief visits home.